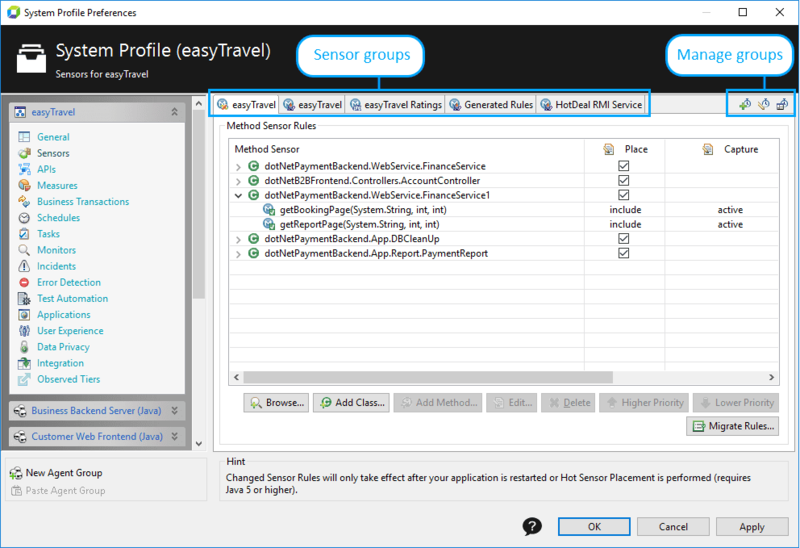 The Sensors item of the System Profile Preferences dialog box allows you to manage Sensor Rules. Sensor Rules are organized in Sensor Groups inside of a System Profile. Besides Sensor Packs, Sensor Groups are the atomic entities in Agent Group Sensor Placement and Sensor Configuration settings. You can manage changes to whole Sensor Groups instead of single rules. You can also create Sensor Groups from technologies that the System Profile supports. Browse Opens the Class Browser. If an Agent is already connected to this System Profile and classes are loaded, the Class Browser displays the SUD class hierarchy. You can then select packages (assemblies) as well as classes and methods to create new Sensor Rules. See Class Browser for more information. Add Class Adds a Class Rule. May also cover package or assembly rules depending on the Class pattern. Add Method Adds a Method Rule. You must select a Class Rule to execute this. May over more than one method depending on the method name pattern and argument rules. For example, an empty method name pattern is interpreted as all methods of a class. Edit Edit the selected Sensor Rule. Delete Delete the selected Sensor Rule. Higher Priority Move the Sensor Rule up by one. This increases the Rule&apos;s priority. Lower Priority Move the Sensor Rule down by one. This reduces the Rule&apos;s priority. AppMon 2018 April and later Migrate Rules Migrate Sensor Rules to the AppMon Agent Platform. See Sensor rules migration for more information. See Sensor Configuration to learn how to manually define Sensor Rules. A rule set can be packaged into a globally available sensor pack. To do this, select the required rules, right-click and select Create Sensor Pack. The newly created service pack is available in the Sensor Packs item of the Dynatrace Server Settings dialog box. There you can also export this sensor pack into a .dtcs file.